Cartier's Pasha Seatimer is a charming timepiece with a lovely dose of elegance. This one, model W3140004 comes with a thrilling combination of 18kt pink gold, white rubber and stainless steel. Not to mention the highly dependable Swiss Chronograph engine, making it a completely gorgeous statement of luxury and sophistication, which you can always count on. 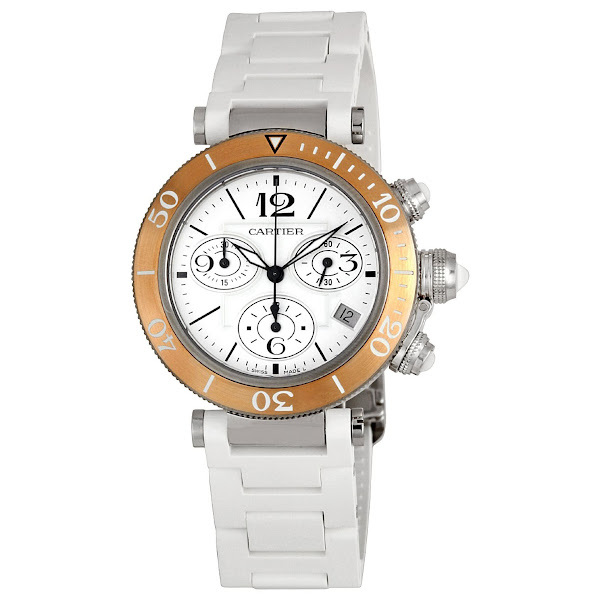 This beautiful timepiece begins with a rounded 37mm stainless steel case and solid case back. At its main display, the wristwatch's silvered opaline dial has three sub-dials for its chronograph functions with 12 hours, 30 minutes, 60 seconds subdials. Plus, date window at 4 o'clock, along with luminous hands and stick hour markers. There are Arabic numerals mark the 3, 6, 9 and 12 o'clock positions, while its minute markers around the outer rim. Just like the most of Cartier's finest luxury watch, this timepiece features a scratch-resistant sapphire crystal. Its fixed bezel finely crafted with a high grade 18kt pink gold, and it also has a screw down crown. Offering an ease of use and comfort, the watch also sports a white rubber bracelet, completed by a double push-button deployment clasp for secure placement. And completing its functionality, this Swiss Quartz movement powered women's watch also boasts water resistance up to 100 meters (330 feet). Cartier Pasha Seatimer W3140004 is available in a single model, with a women's standard length. As for pricing, this Swiss made luxury watch's original price is $6,590. You can find an original Cartier W3140004 Watch at the site(s) listed above. However, we don’t guarantee its availability as being listed here simply means that those site(s) has the item in question by the time we wrote the review. The review in this page is written by garnish at Friday, June 29, 2012. The post is tagged as analog, cartier, quartz, rubber, watch, women.